My name is Ray DeCosta and I'll admit it: the title "About Us" is a bit of a misnomer. But on the other hand, calling this page "About Me" sounds waaaay too much so I'll just stick with the more conventional title for this page. RCDC Web Design doesn't have any kind of a large staff or vast Customer Service department. RCDC Web Design is really just me living in Prescott, Arizona and I spend a LOT of time at my computer doing various tasks. 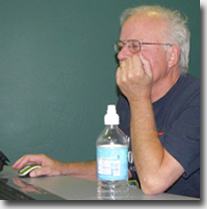 Currently, I provide services for several websites, help teach Photoshop classes at Yavapai College and am an active member of the Prescott Computer Society (PCS) which is the largest computer club in our area. It might not surprise you to learn that I also maintain their website which I suggest you visit to see a larger sample of my work. I also do presentations at PCS on various advanced topics. And if my work for PCS somehow isn't enough, I also help write columns for the local newspaper on computer general-interest topics. If you wish, you may check out my columns by looking at the PCS database of articles. Personally, I have had a lifelong interest in computers and consider myself fairly proficient in VB.Net and ASP.Net coding. My experience has come in handy many times when I'm attempting to get to the root of a computer-related problem. Please feel free to contact me regarding your web design needs.